SHARES in Sibanye-Stillwater were under pressure today following a company announcement it had raised R1.7bn by means of a share placement – cash it would use to pay down debt amid a strike at its South African gold mines. The stock closed just over 17% weaker on the Johannesburg Stock Exchange. On a year-to-date basis, shares in the company are 40% higher owing to improved prices for palladium and rhodium and a deterioration in the value of the rand to the dollar, although the rand has regained ground in the past month. The company sold new 108.9 million shares, equal to just under 5% of its issued shares, for R15.50/share, raising gross proceeds of R1.7bn. The issue price was at a 2% discount to the volume weighted average share price on April 9. On April 8, announcing it was to begin the book-build process, Sibanye-Stillwater said its gold mining operations had been heavily affected by a strike involving members of the Association of Mineworkers & Construction Union (AMCU). It said it would use the cash to cut debt especially as wage negotiations in the platinum sector fall due in May or June. “It is pleasing to note the significant oversubscription of the transaction which is testament to the strong market support for our company,” said Neal Froneman, CEO of Sibanye-Stillwater in a statement following announcement of the successful book-build. He added the firm was confident about its plans to deleverage the balance sheet. Analysts were largely sanguine on the book-build as well. “The equity raise, in our view, was unexpected,” said analysts for Goldman Sachs in a note. “However, it does help the company de-lever and positions it well in case the PGM [platinum group metal] wage negotiations result in a strike like [that] at the gold operations,” the bank added. Adrian Hammond, an analyst for Standard Bank Group Securities, said the decision to raise cash was prudent given the gold strike was taking longer than expected to resolve. He also referred to other headwinds identified by Sibanye-Stillwater in a first quarter update, also issued on April 8, including the delay in refined metals to Anglo American Platinum following the adoption of a roll refining agreement in terms of Sibanye-Stillwater’s takeover of the Rustenburg Mines. “We do not view this decision as negative for fundamentals, but rather as maintaining a hard line with AMCU and as a precautionary measure,” he said. Nonetheless, investors fled the share whilst in comparison, other gold shares fluttered down gently on the day (AngloGold Ashanti -2% weaker). Hammond said the impact of the AMCU strike on the gold mines should not be estimated given the high fixed cost nature of the gold mines. He described Sibanye-Stillwater’s current financial year as a “non-event” and estimated the gold business would have a R1.5bn negative contribution to EBITDA. Hammond also said Sibanye-Stillwater was being overly cautious regarding the prospect of a prolonged wage related strike in the platinum mines given possible gold sector exhaustion following AMCU’s four-month strike. 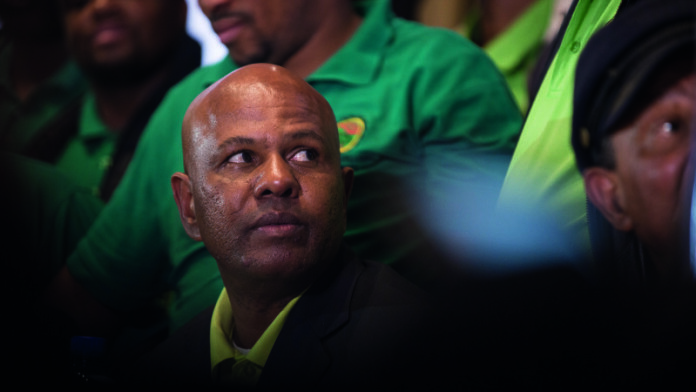 But Joseph Mathunjwa, president of AMCU, was a presence on the headlines and airwaves in Johannesburg yesterday. This followed comments he made at a PGM investment conference in which he declared AMCU would never bow to Sibanye-Stillwater and controversially compared Froneman to the white imperialism of rand lord Cecil John Rhodes. Sorry Joseph, Neal is better compared to a modern day Maggie Thatcher than your emotive CJR quote! Your colonialist and racist comparison shows your weak position. Neal, like Tgstcher understand that the only hope for South African mining is if unions grip on the industry is weakened. Market forces and SA’s high unemployment will prove him right! The alternative is you stick to your mantra and destroy the industry for all including workers! Not sure what Neal would make of that comparison. Hi maggie did you visit the mining industry bfore or your job is to praise something that you like. We are suffering in this gold mining sector since 1864, to 1994 and even today we are still pushing the same wegon. Maybe you enjoy tobe what you are, unfortunately i enjoy to be african but i do not enjoy the way how the mining industry treating African workers. Amcu shall set us free or shutdown the mining if it continue run like spaza shops. Neal is working for Shareholders, Joseph is working for himself. What workers want is oONLY achievable if it is aligned to productivity that the mines can compensate workers for. Unions are completely against ANY form of productivity linked compensation because workers will fast realise there is NO need for unions. Unions are like a giant pyramid scheme, eventually it destroys itself. Neal won’t fall, he will get stronger and more confident because what he is doing is the only sustainable solution for the industry. Demanding something that is unachievable is stupidity. Rather ask people like Neal what needs to be done to make those sort of wages possible, he will find an answer but it’s linked to productivity, believe me! White people always saying Joseph Mathunjwa is weakening the South African mines while they forget that black miners are still underpaid. Thank you Maggie, you sum it up perfectly. maybe it will mean the end of sibanye, but then stillwater will continue. The big giant amcu will not succeed, but only destroy itself, leaving thousands of workers with no income or future. And congratulations to the last commentors above, shows YOU have NO idea what mines are about! NO mine has and will ever mine at depths below 4.5km due to a number of factors. With this to say the workers are underpaid is also big farce. And if they complain about the CEO pay, why dont they all 13000 become CEO’s rather, instead of burning and throwing stones when they are unhappy. Their full payment is more that what they ask, but it has become a pure political driven action, which will send them home to their families with empty pockets and futures. Keep on fighting, it is and was always your answer to solve problems in your world!